We arrived in Venice in grand style, via water taxi from the airport. Cruising through the lagoon, past several of the islands that are part of Venice—Murano, Burano—and into the Grand Canal, where the city of Venice slowly revealed herself in all her louche, faded glory. The Grand Canal is like any major street in any large city, except instead of concrete, it’s ‘paved’ with water. The Grand Canal is bustling with all manner of boat traffic: water taxis, vaporetti- which are like city buses and run on schedules, trachetti-small stand-up ferries that cross the Grand Canal, gondolas, the boat equivalents to trucks. And just like Italian automotive traffic, there doesn’t appear to be any rhyme nor reason to the direction in which all these boats are going. Yet, somehow, it works. 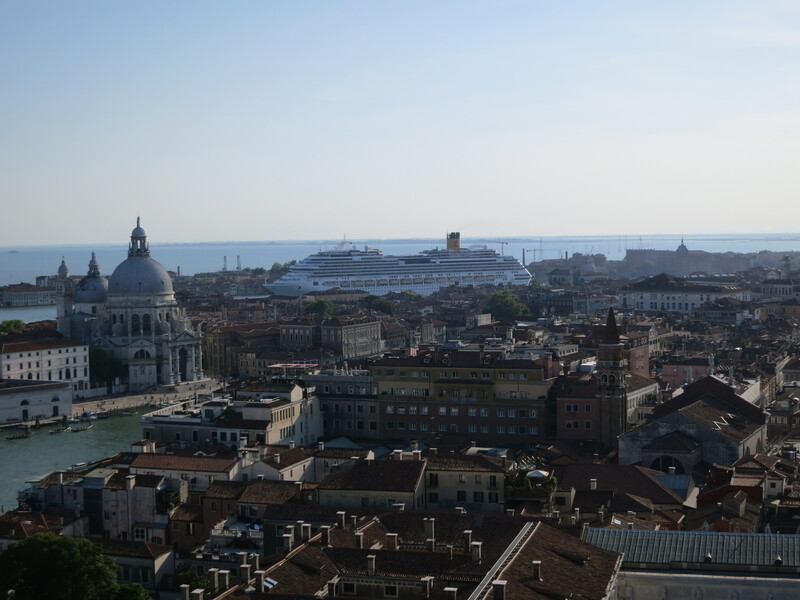 One of my favorite things to do was to watch the traffic on the Canal from any vantage point, whether it be the top of the Rialto Bridge or the terrace of the Guggenheim Art Museum or the top of the Campanile at the Piazza San Marco. The first night was completely uneventful—just the way I like them. Checked into the hotel and got upgraded to a ‘suite’, which turned out to be a room with a lofted bed, up a narrow and very steep stairway. Interesting. Tiny little bath, which managed to contain double sinks, a sizable bath, a toilet and a bidet. Again, interesting. Also downstairs, wardrobes and a sitting room with a daybed, a chair and a television. We went out to look for something to eat and walked nearly to the Rialto Bridge and found a small ristorante. Venice isn’t really known for its food. The next morning, we walked over to the Jewish Ghetto and toured the Museo Ebraico. From there, we caught a vaporetto, intending to go to the Piazza San Marco. Alas, being unfamiliar with how they worked, we went the wrong direction and went to the end of the line. We then had to change boats to get to the other end of the line. So we got to cruise the entire length of the Grand Canal on a vaporetto. Once at the Piazza, we met up with friends who are staying in Padova who had trained into Venice to meet us. We went to the Caffe Florian for coffee. Fifty euros for a caffe latte. OK, 1 caffe latte, 1 small bottle of water and 1 small sandwich. Plus 6 euros each for the pleasure of listening to the music emanating from the bandstand. At least, the people-watching in the Piazza was free. The four of us next walked over to the Guggenheim Art Collection, crossing the Grand Canal via the Accademia Bridge. We got lost looking for the Collection. But not really. That’s the wonderful thing (one of them, anyway) about Venice. You’re never really lost. Just keep walking and turning and eventually you find yourself where you want to be. Or maybe not where you thought you wanted to be, but someplace delightful, just the same. The art was nice, but the high point for me was sitting on the terrace fronting the Grand Canal and observing. I fell in love with a home, or possibly a small hotel, across the Canal and daydreamed about living there. We then went back to the Piazza and up to the top of the Campanile for its 360 degree views of Venice. Up there, I saw a cruise ship being towed into the lagoon from among the low rise buildings of the city. The scale was so incongruous that the ship looked like it had been dropped onto a movie set. We ate dinner early (for Venice) because our friends had to catch their train to Padova. The next day, we toured the Basilico San Marco and the Doge’s Palace and crossed the Bridge of Sighs. We managed to attach ourselves to a tour being led by a British guide. Not my first time at this particular rodeo, I can assure you. We walked over to the Rialto Bridge and climbed to its highest point and watched the traffic. Stopped at a gelateria, walked back to our hotel and crashed. Jet lag finally caught up to me. After nap time, it was time for a gondola ride. Just as in all the guide books, we found a gondolier, spoke with him a bit and off we went. He’s a fifth-generation gondolier (but has only daughters) and he had a lovely boat. We went around some smaller canals, into the Grand Canal and back into the smaller, back canals. He pointed out various sights–Casanova’s house, Marco Polo’s house, the workshop for La Fenice (the opera). Maybe yes, maybe not. It doesn’t matter. He even sang…Ciao, Bambino. At dinner, we struck up a conversation with the couple at the next table. They were from a small town in France, just across the border from Geneva, Switzerland. The conversation took place in fractured French (mine) and fairly decent English (his). We talked about travel, our kids, shared photos and had a pleasant time. Striking up casual conversations with total strangers became a theme of the trip. In Florence, we even picked up a couple of stalkers from Vancouver, Canada. Ran into them again in Positano. Venice offers lots of surprising views, each one beautiful. A peek around a corner reveals a small canal or a faded palazzo or a glimpse of every day, ordinary Venetian life. All those canals are crossed by bridges and all those bridges have steps going up and steps going down. Be prepared to put your climbing shoes on. The best and most absurdist part of the Venice stay happened the final day. We were sitting on the steps of the Ferrovia (the train station) waiting for our train when, suddenly, a band of Hare Krishnas came into view. Complete with orange robes and playing finger cymbals. Hare Krishna, Hare Rama. It’s almost as if I was there. Wait a minute I was and it’s completely accurate. Ciao! I’m ready to book a flight (both in vino and with frequent flyer/spender points)!